Ecoterrorism refers to the use of violence of a criminal nature against innocent victims or property for environmental-political reasons. Often of a symbolic nature, acts of ecoterrorism are usually committed by individuals who believe that the exploitation of natural resources and despoliation of the environment are becoming so severe that action outside of conventional legal and environmental channels is required. Using disruptive actions to call attention to an issue is hardly an invention of modern times, and radical environmentalists have taken their cue from the larger arena of sabotage and extreme civil disobedience. Modern radical environmentalists saw themselves inheriting the 1960s mantle of the Weather Underground and the Students for a Democratic Society (SDS) in using "direct actions" to put pressure on corporations, universities, and government agencies to adopt environmentally friendly policies. Although vandalism and property destruction are clearly illegal, the issue of whether it is morally defensible to use such tactics is complicated. A 2001 Gallup Poll shows that a majority of Americans favor strong environmental protections over unfettered economic growth, and a 2002 League of Conservation voters poll showed that 81 percent of voters support either stronger environmental regulations or stricter enforcement of existing environmental laws. This public opinion may contribute to a romantic view of ecoterrorists, with their actions seen as part of a Robin Hood–like struggle—the weak fighting back against the strong. Such a view has been evidenced in popular culture for the last few decades, for example, in Edward Albee's 1975 novel The Monkey Wrench Gang. Others, usually corporations, trade associations, and property owners, see ecoterrorists as criminals, on par with revolutionaries and anarchists. Ecoterrorism occurred as early as 1977, when disaffected members of Greenpeace formed the Sea Shepherd Conservation Society and began a campaign of cutting fishing vessels' drift nets. However, the group of radical environmentalists best known for extreme tactics as a key part of their strategy is Earth First!, formed in the early 1980s. The American branch of Earth First! gained notoriety for its tactic of tree-spiking, whereby a large metal spike was driven into the trunk of a tree destined for logging. When loggers' saws hit such a spike, they would be damaged beyond repair, forcing the workers to stop, slowing the rate of logging, and costing the timber companies time and money. Although Earth First! insisted that it meant no harm to the loggers, several workers were injured with spikes, and some of the popular support for Earth First! waned as a result. Eventually, the group was forced to abandon its tactic of tree-spiking. When Bill Clinton was elected president in 1992, environmental groups anticipated an administration sympathetic to their concerns, and their rhetoric lost some of its stridency. In reaction to this seeming weakening of resolve, a more radical offshoot of Earth First! renamed itself the Earth Liberation Front (ELF). ELF sees its actions as a matter of self-defense: protecting the earth from the greedy individuals and corporations that it views as destroying the environment's ability to sustain life. Since the ELF sees the perpetrators as committing violence against the environment, it feels justified in using violence in the form of economic sabotage, in order to "remove the profit motive" from environmental destruction. Law enforcement and some lawmakers, however, view ELF (and its sister organization, the Animal Liberation Front or ALF) as nothing more than garden-variety terrorists. By financial standards, ecoterrorists have been very effective. 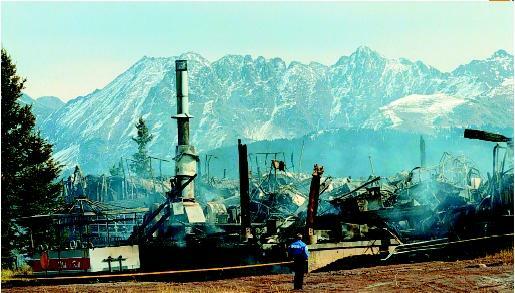 ELF's campaign of property destruction has cost some $43 million since 1996, including the 1998 firebombing of the Vail, Colorado, ski resort that resulted in $12 million in damage. It has also generated considerable media attention in order to air its grievances. However, ELF has been less successful at stopping or slowing the development it seeks to prevent. In fact, those who have had property destroyed often feel a renewed resolve to continue with their projects so as "not to give in to terrorists." Of the sixteen major actions taken by the ELF in 2001, none have resulted in the permanent closure of a business or facility. The Vail ski resort, in fact, was rebuilt on a larger scale. Arson damage at a ski resort in Vail, Colorado. (© Affleck Jack/Corbis Sygma. Reproduced by permission. Huntingdon Animal Cruelty (SHAC), has openly espoused more violent actions and stated that they may no longer hold the line against harming humans. In addition, congressional hearings chaired by Rep. Scott MacInnes of Colorado on February 12, 2002, called on mainstream environmental organizations to disavow ecoterror groups like ELF. The FBI has also formed joint terrorism task forces with local police around the country to investigate ELF actions. However, although COINTELPRO, the official FBI domestic counterintelligence program, was mothballed in 1971, some environmental groups feel that they have been harassed by FBI investigations of their legal activities, such as demonstrations and protests. Furthermore, they assert that the FBI has intentionally bungled its investigations of violence against environmentalists, such as the 1990 Oakland car bombing of former Earth First! activists Judi Bari and Darryl Cherney. In June 2002, a federal jury agreed, awarding $4.4 million to Cherney and the estate of Bari, who died of cancer in 1997. Whether the new Department of Homeland Security will inherit the COINTELPRO mantle remains to be seen. A new nonprofit group, Stop Eco-Violence, formed in Portland, Oregon, to demonstrate the harm of ecoterrorism to communities where it occurs. Stop Eco-Violence hopes to expose the terrorists and their funders, and assist law enforcement agencies by serving as a public clearinghouse to track ecoterrorism cases. The ultimate morality of ecoterrorism remains uncertain, mirroring the larger debate of whether the use of violence is justified for a good cause. Most mainstream environmental groups decry sabotage tactics in favor of public education, and law enforcement agencies will continue to prosecute those responsible for acts of ecoterrorism. However, there are those who believe that without such tactics, economic pressures will destroy the environment and all its resources. SEE ALSO A CTIVISM ; T ERRORISM . Abbey, Edward. (1975). The Monkey Wrench Gang. New York: HarperCollins. North American Animal Liberation. (2001). 2001 Year-End Direct Action Report. Courtenay, BC: North American Animal Liberation Front Press Office. Pittman, Alan. (2001). "Ecotage: Sabotage to Save the Earth Generates Backlash." Eugene Weekly 20(10), March 8, 2001. Richman, Josh. (2002). "Bombshell Verdict: Earth First Activists Win $4.4 million from Cops." Oakland Tribune, June 12, 2002, pp. 1, 9. Zakin, Susan. (1993). Coyotes and Town Dogs: Earth First! and the Environmental Movement. New York: Viking. Barcott, Bruce. (2002). "From Tree-Hugger to Terrorist." New York Times Magazine, April 7, 2002. Available from http://www.nytimes.com/2002 . Chadwick, Benjamin. (2000). "Jamming the Gears: Are These Front-Line Fighters Eco-Heroes or Eco-Terrorists?" E Magazine, 11(5). Available from http://www.emagazine.com/september-october_2000/0900curr_jamming.html . Federal Bureau of Investigation. (2002). "Congressional Statement of James F. Jarboe, Domestic Terrorism Section Chief, Counterterrorism Division, Federal Bureau of Investigation on the Threat of Eco-Terrorism before the House Resources Committee, Subcommittee on Forests and Forest Health." Available from http://www.fbi.gov/congress . Federal Bureau of Investigation. (2002). "History of the FBI." Available from http://www.fbi.gov/libref . Gallup Poll. "The Polling Report, March 5–7, 2001." Available from http://www.pollingreport.com/enviro.htm . North American Earth Liberation. (2001). Frequently Asked Questions about the Earth Liberation Front (ELF). Portland, OR: North American Earth Liberation Front Press Office. Available from http://www.earthliberationfront.com . Southern Poverty Law Center Web site. "From Push to Shove." Available from http://www.splcenter.org/intelligenceproject/ip-index.html .